I will try to give a picture for you. 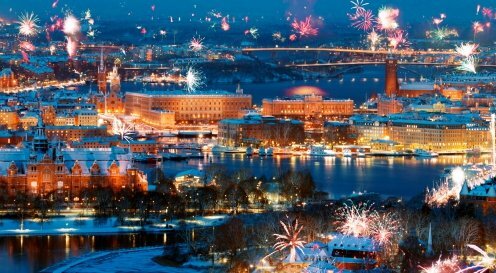 Christmas celebration in Sweden is an extreme family occation with the peak during afternoon - evening on the 24th. This means that most shops that still are open close at noon, Many restaurants close too. Swedes do not tend to celebrate Christmas, entertaining in restaurants like in many other countries. Many hotels are very silent too. Christmas gifts are given in family gatherings on the 24th. Not on the 25th which is a more silent day. This does not mean that you should stay at home, I think you can enjoy it anyway. You could do something not so expected at this time of year by boarding one of the regular boats to the archipelago. Try going to Vaxholm ( - one hour away from central Stockholm. Boats leave from just outside Grand Hotel ( Vaxholm is a cosy and nice little old town guarding a narrow strait with its old fortress. Many young people go out on discos in the evening on the 25th. In many cases this is a way for them to meet other people from childhood and schooltime, now home visiting parents or relatives in the place they grew up. These Christmas Day discos can be great fun with many relaxed happy people out. The 25th is in many cases a day of late wake up, a christmas lunch and a christmas dinner visiting friends or relatives. As mentioned by another poster it is possible to eat a traditional christmas meal on the 25th in some restaurants, and the suggested is maybe the best. Stockholm is such a beautiful city so, depending the weather, i could be a very nice visit just to stroll around watching the houses, the streets, the sights, the parks.